These hilarious Joe Biden memes are the perfect revenge against Donald Trump’s ridiculous presidency. President-elect Donald Trump is set to take office on January 20th provided the electoral college doesn’t turn against him, allegations of Russian meddling in the election don’t turn out to be true (which seems less likely with each passing day), or some other revelation or incident don’t turn against him. In the meantime, these Joe Biden memes are taking the internet by storm. Biden can be seen beside the President making the sign of the cross. Amateur photographer Joshua Billinson was one of the first creators of the Biden memes producing such favorites as this one mocking Trump’s perpetuation of the birther claims against Pres. Obama. 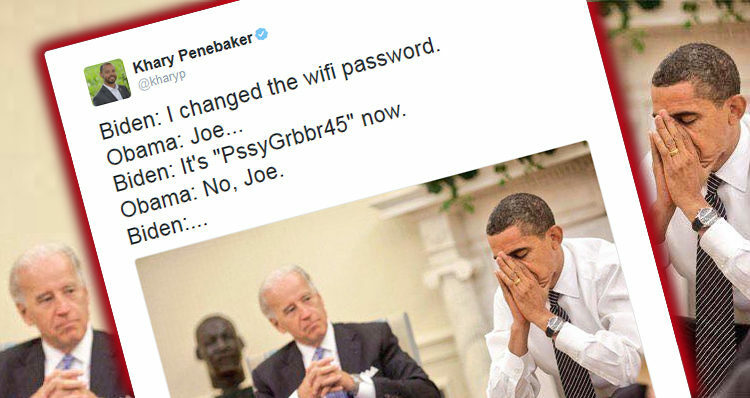 Biden: I changed the wifi password. Press: What do you think about Trump becoming president? Joe: The orange man with tiny hands?